Tassimo is a system letting you prepare a wide range of drinks at the touch of a button. With Tassimo T-disc pods, you can vary your pleasure with a large range of coffees, teas and tasty drinks. The Tassimo machines works exclusively with Tassimo pods (also known as T-DISCs) and includes an intelligent barcode recognition system. 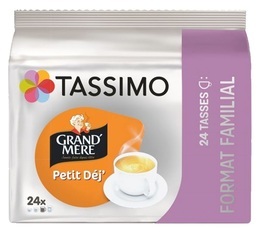 We offer a wide range of Tassimo T-Discs pods at the best prices to let you make a real Italian espresso, a hot chocolate or even a good tea.